Projects including a bespoke touch-screen interface are easily completed when all of the required elements are already proven to work together. A modular ARM-based (or x86) embedded system using the latest processors, running Linux, Android or Windows with proven support for GUI-programming methodologies such as Qt Embedded should be your starting point, along with pin-compatible TFT screens with integral touch-panels. Everything should easily work together, but the devil is in the detail, and so choosing a partner like Direct Insight with 20-years’ experience of helping touch-screen-based projects along gives you the best chance of a smooth road ahead. We strive to support the broadest possible range of touch screens and GUI technologies. We can recommend and supply a display, but also support almost any 3rd party TFT, whether resistive or capacitive touch, directly connected via parallel RGB or using LVDS, HDMI, MIPI-DSI or DisplayPort. Touch screen based user interfaces are foremost in the solutions we provide in industrial, medical, transportation and enterprise applications. A tiny, production ready ARM Cortex-A8 / A9 based module is often the ideal engine for this type of project, and we offer ready-to-use sets of module + baseboard + touch screen which could be the starting-point, or even the final solution for your custom project. If you are thinking of creating a system with a touch-screen, but don’t know where to start, you can access our expertise in a variety of ways. Fill in our touch-screen project definition form, which signposts the key questions which will define your solution. Contact one of our engineering support team who will be happy to discuss your project in technical detail. Or read on, to discover how for low to medium volume projects, a modular, production-ready solution can get you to market in a matter of weeks. We ensure that our extensive range of modules can work with the resistive or capacitive touch screen that best suits your application. This starts with the development system, such as the Mainboard-7 – which is common to our TRITON-TX range of modules – which can be supplied with a range of capacitive and resistive models with a unified interface, working out of the box. We can also soon help you to interface almost any other screen type. In production, while some customer projects go on to use the same displays as supplied with the development system, many choose displays from other vendors, and our goal is to make it easy to use the display of your choice. 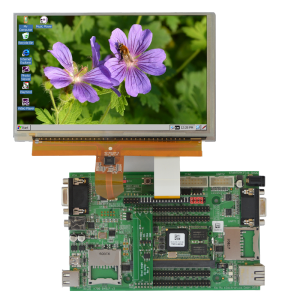 The board support packages for Linux and Windows CE / Compact 7 / Compact 2013 which are provided for the various modules all support the full range of EDT resistive and capacitive TFT panels – and are also easily configurable to support other manufacturers’ displays. All modules support capacitive touch via an I2C interface, some also offer resistive touch options.